Regional Judges are asked to consider all projects for the Innovation Award. For the first time this award is presented on a regional level and recognises a significant level of innovation in one, or more, fields. In recognition of the importance of this category, and to highlight some of the exceptional innovative concepts that are developed across the UK’s buildings every year, the BCO introduced the Regional Innovation Award. 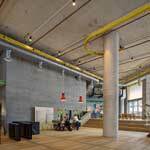 This building challenges traditional concepts of the workplace on many levels. Just its very presence has been instrumental in re-defining an area of London as a business location. From its ground floor uses, the utilitarian aesthetic and its unique combination of building structure and services, there has been a consistently innovative approach to how the building works and what it delivers for its occupiers. The new boundaries which this building has crossed will deliver lessons for office development for many years to come. 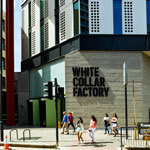 The White Collar Factory, in the Old Street Yard development, is positioned in a prime location on the ‘Silicon Roundabout’, with a sixteen-storey tower as its anchor. Alongside the tower reception entrance is a permeable opening that leads to a buzzing landscaped plaza at the heart of the development. The scheme is the outcome of a uniquely bold and ambitious research project, undertaken over almost a decade by the client, architect and design team. From the moment one enters the reception space in the main tower it is clear this is no ordinary office building. The tall concrete lobby includes a coffee bar positioned on a stepped timber podium, a projected tenant directory and a servicing platform that doubles up as the reception desk when it is in resting position. Inside the building concrete is used in a variety of creative architectural and engineering methods: It is raw and exposed in the lift lobbies, displaying the remarkable quality of the contractor’s formwork and at high level it carries the services and temperature control for the building, working in conjunction with the openable windows. These are set in a bravely articulated façade which provide ventilation during favourable conditions indicated by an ingenious traffic light system. 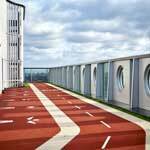 On the roof, a landscaped terrace provides panoramic views over the City’s towers, and overlooks a running track built over the BMU layout on the level below. This addition, offering occupiers a space to jog away from the polluted streets below, is the literal crowning feature of a project that is truly innovative in almost every aspect and will continue to set a high benchmark long into the future. The White Collar Factory was praised by the judges for having challenged the very concept of the workplace. Boasting a roof top running track and a café bar, White Collar Factory is seen to deliver a unique combination of services that the judges felt was clear evidence of Derwent London’s innovative approach to how the building delivers for its occupiers. The judges also noted the positive impact the development has had on the local environment – describing it as ‘instrumental’ in re-defining Old Street as a location for business. 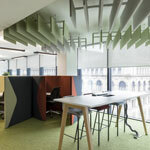 The judges were impressed with how the new offices, to which The Edrington Group’s staff were relocated, incorporated the brand throughout the design process. The panel noted that by involving staff members in a workshop about the design of their new headquarters, the project delivered a workplace that employees were excited to relocate to. The finish, in the view of the judges, is a less corporate, but distinct aesthetic which incorporated a selection of cost-effective materials and is inspired by the industrial distilleries and bottling plants that process Edrington’s products. The BCO judges applauded Hilson Moran for its sustainable approach, earning the development the UK’s third WELL Certification. With 40 years of experience designing environmental services, Hilson Moran set out to deliver an exemplar project for their own office, located in the Neo building in Charlotte Street. The judges added that the challenge of achieving WELL Certification in a fit out should not be underestimated. Many initiatives were implemented with a view to improve employee health and wellbeing, such as local adjustment of office temperatures and personal lockers, design features such as green moss walls in the collaboration area, and plants which were carefully selected to help remove pollutants from the air. The judges described The Porter Building as having delivered a cutting-edge workplace for the region. They noted that the building, which was the first in the UK to achieve certification through the WELL Building standard under the core and shell category, incorporated an awareness of health and wellbeing throughout. Located directly opposite the town’s railway station, in the judges’ view, the development has delivered a prominent centrepiece in the wider regeneration of Slough.